Select the corresponding connection from the drop-down list. Opens a dialog where a new connection can be configured. All file attributes, which can be shown in the FileWalker list, are shown here. The file attributes listed here will be shown in the FileWalker list. Move the selected file attributes from one list to the other with these arrow buttons. The order of the file attributes can be adjusted with these arrow buttons. 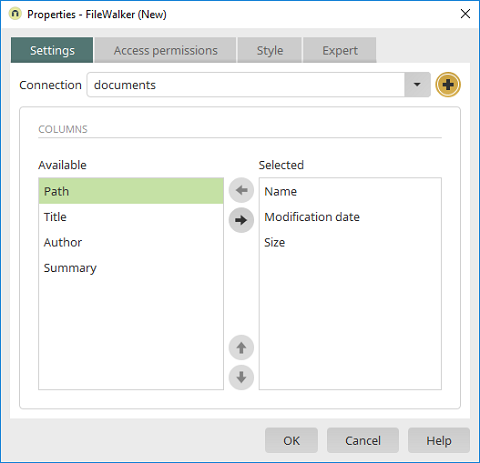 The following applies here: The higher up a file attribute is in the list, the further to the left the corresponding column will be displayed in the FileWalker list. The element is shown in the browser with "FileWalker" in its title bar. The element displays all files and folders stored in the connected directory. This button is shown on the right in the title bar. When the user clicks on this button, a search field will appear where terms can be entered to search through files and subdirectories. The "Block" setting displays the file list as shown above. The "List" setting displays the file list as shown above. Shows a tooltip where you can select which fields should be displayed in the file list. Navigates to the superordinate directory. Opens a tooltip where a new directory can be created. 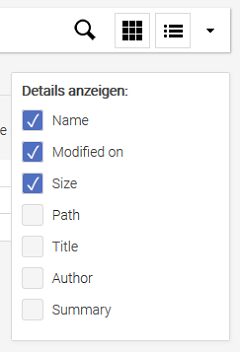 Opens a tooltip where a file can be selected and uploaded. 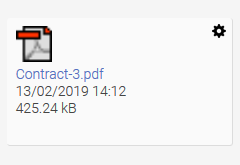 Refreshes the content of the currently opened folder. Changes the sorting based on the field selected in the drop-down list in ascending or descending order. Click on a file name to open the file. The program that opens depends on the file type. If the mouse is over a file or folder in the list, the "File options" button will appear to the right of the file and the "Directory options" button will appear to the right of the directory, respectively. This button opens a tooltip with additional functions. Opens a tooltip where the file name can be adjusted. Creates a copy of the selected file and opens a tooltip where the copy can be named. Opens a tooltip where the directory name can be adjusted.